The Needham, Massachusetts native revealed Monday she won't attend Larry Nassar's sentencing hearing. Olympic medalist Aly Raisman revealed Monday she will not be attending the sentencing hearing for former USA Gymnastics team doctor Larry Nassar. The 54-year-old spent nearly 20 years as the team doctor for the U.S. women's elite program, often working with athletes one-on-one. He is set to be sentenced Tuesday where he will listen to nearly 100 women and girls who say he sexually assaulted them. 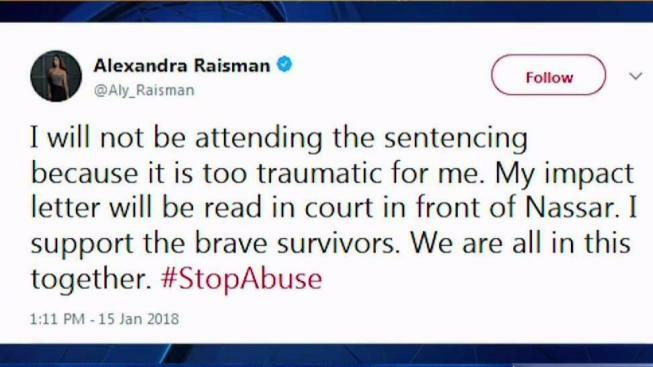 Raisman said on Twitter she won't be in attendence because it will be "too traumatic" for her. Her victim impact statement, however, will be read in court. The Needham, Massachusetts native also tweeted, "I support the brave survivors. We are all in this together." Raisman also tweeted her support for her Olympic teammate Simone Biles, who revealed Monday on social media that she was also molested by Nassar. "I am so proud of you. You are incredible Simone," Raisman tweeted. "I stand with you. I am shaking reading your post. I know we will all get through this together." Biles' statement makes her the fourth member from the 2012 "Fierce Five" team to come forward, joining Raisman, McKayla Maroney and Gabby Douglas with accusations against Nassar. Since coming forward, Raisman has become an increasingly outspoken critic of USA Gymnastics, blaming the governing body for a lack of oversight on Nassar's conduct. She tweeted Monday that an investigation "must be done" on USA Gymnastics. "I am sick over this. We must get to the bottom of how this disaster happened."